As we approach the end of July I come to the unfortunate realization summer's end is but a few weeks away. And after what seems like an endless rainy spell that's lasted much of the summer we're finally getting some heat; better late than never. Our crops here at Johnny's have survived amazing well. The tomatoes (and we've got lots of them) are looking good. Constant scouting for disease and pest damage, coupled with an aggressive fungicide program, has left them in pretty good shape considering the weather conditions since we transplanted them. The breeding workshop and the trials have all been trellised so that has helped them by getting them at least some air circulation. We basket weaved a tomato for seed production; a first in memory. It's a cherry tomato, and with several other cherry tomatoes in production this year, I am concerned about how long it's going to take to harvest them for seed. Many years ago we did a cherry that had over 500 tomatoes in a bucket, and it was prolific (you could sit in one place and fill a bucket); so it takes a while to pick 500 cherry tomatoes. Couple that with the fact we have a half acre of these little devils... well, you can see where I'm going with this. So anyways, we did basket weaving so at least we won't have to be on our hands and knees for days on end picking these. Other seed productions we have this year include melons, squash, pumpkins and cucumbers. Melons are probably the most fun to do. We wait until 90% of the fruits are in the "ripe to overripe" stage and then pick them, slice them in half and dump the seeds into buckets. While some of the fruit are well beyond eating stage there's always a few that makes you wish you'd brought a spoon. A lot of people can't stand to eat what we're harvesting, especially if they have a weak stomach, but some of us enjoy it. Nothing like a cool and sweet melon while working in the field on a crisp but soon-to-be warm day. Critters are keeping Jeff busy catching and releasing. He started in earnest last week and has gotten a squirrel, two raccoons and two quill pigs (porcupines) so far; all within a week. The squirrel went home with him to get released into his new home up the road a bit, the big quill pig went down on the "bog" six or seven miles away, the raccoons went to Palermo on a back road and the baby porcupine went to the Wildlife Care Center in South China as he was pretty small to be on his own. Bait of choice this year, and yes I know it sound strange, is sliced apples in a shallow bowl of peanut butter. That combination works on everything except raccoons; they prefer canned sardines. Until next week, enjoy the summer while it's here. Despite the weather the crops are growing well. We started squash pollination just two days later than last year. The plants are responding with rapid growth to the day or two of sunshine we have been getting. There's a fair amount of disease around this year; not unexpected with the weather conditions we've had, and are having, but not as much as we expected. Insect pressure continues daily with aphids and Mexican Bean beetles topping the list. I saw Japanese beetles yesterday for the first time this year. Luckily they're easy to kill but fly in as soon as their brethren die off. Some of their favorite crops include bush beans, raspberries and grapes. Rosa rugosa roses are a good plant to keep an eye on as they love the blossoms. Best time to spray Japanese beetles is first thing in the morning while they're clustered together in bunches waiting for the sun to warm them up. Of course you have to keep spraying them as new ones fly in routinely. Pyganic works well on them. Mexican bean beetles will make short work of your bush beans if you don't control them. A couple of sprays of Pyganic should keep their numbers in check. Mexican Bean beetles are members of the ladybug family; one of the only members that don't eat other insects. The adults lay their eggs mid-summer on bean leaves and the larvae hatch out and they do the most damage. The larvae are yellow and fuzzy. Here again they're easy to kill and a couple of sprays ought to do them, but you've got to do it. Onion thrips are out; by the time you see their damage it's too late. We scouted last week and found some so a weekly spraying of Pyganic has started. Thrips also damage gladiolas and iris so if you have them an early spray should keep their numbers on check. They will destroy or severely weaken the crops aforementioned and a couple of sprays a week to ten days apart will keep their numbers down. Monterey Insect spray and Entrust will kill them. Aphids are out in force as they usually are. Certain flowers and crops seem to attract them in great numbers; they're easy to spot where they are heavily populated. A strong stream of water will wash them off the plants and they will generally not return. Safer's Soap will kill the remaining stubborn ones. When spraying any insecticide it's important to avoid killing the good bugs; the parasitic wasps, ladybugs, mantids, ground beetles and butterflies. We use a "threshold" to determine if spraying and insecticide is warranted. A threshold is a number given to an insect population in a certain crop area. For example if we found one thrip in twenty onion plants that threshold would tell us we needn't use an insecticide as the numbers of insects in really small. If on the other hand we counted twenty thrips per plant spraying would happen sooner than later. The threshold determines when to spray based on whether the pest numbers will do economic harm to the crop. Low numbers usually indicate spraying isn't needed and high numbers indicate the opposite. Until next week keep the bugs in check. For more information, please see our videos on pest and disease controls. We have the right pest and disease control product for your problem; visit our website for more information. I seriously wonder if we're going to get any summer weather. The temps seem below normal and the wet weather continues to hold on - hold on much longer than we'd planned on. If it weren't for these constant challenges it wouldn't be farming. Speaking of challenges this year has been more of a weed control challenge than the past few years. The constant showers and never ending days of cool, wet conditions make it ideal for weeds and diseases to thrive. We rely primarily on mechanical cultivation for the majority of our weed control; it makes it harder when you can't get a tractor into the field for weeks straight. 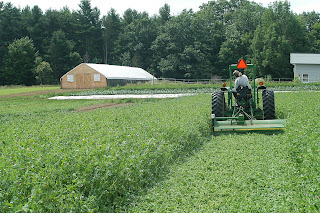 You can do more weed control on a good day than a crew can do in a week; that's why we like cultivation so well. Once the weeds are over a couple of inches tall they are really hard to kill; now other methods of weed control need to be used. Methods like flaming - moderately effective on large weeds, small weeds are best. 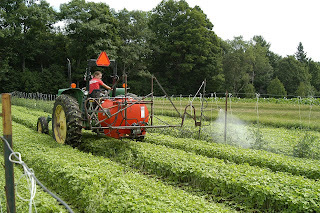 Organic herbicides like clove oil and vinegar are used with some success - thorough coverage is necessary. 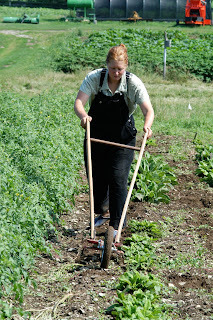 Hand weeding is a last resort as it's very expensive - good, but expensive. Expense is one thing we can't do much about. We have a local farmer who bales what and when we want it and delivers it to the field. His bales are large and he's very accommodating to work with. I'm sure we could find some cheaper but we'd have to hunt around for it, may have to pick it up and may get some noxious weeds or unwanted additions to the hay. I know his fields and I know what grows there so I know what we're getting. We're also supporting a farmer right near Johnny's so we're doing the local thing. Labor to spread it. Having a lot of people makes short work of spreading 250 bales of mulch hay. We will have invested around 160 man-hours in the spreading of 250 big, round bales in a total of about five acres. This may seem like a lot of hours but it's less than half a week for the crew. That's gives 5 acres of total weed control for the entire season for a minimal investment. What to do with it once we're done with the field. Three years ago we left the two fields untouched until the following spring. The mulch protected the soil from fall and winter erosion. 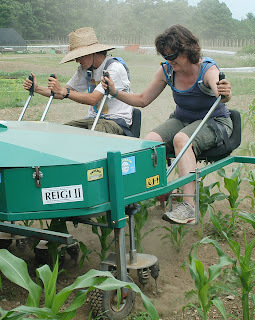 We spread compost and plowed it down. The tomato crop was short that year; the hay breaking down robbed the tomatoes of the nitrogen they needed. Two years ago we raked the mulch off and prepared our ground as usual. Seemed like a waste of organic matter, so this year we spread pelletized chicken manure on the mulch and plowed it down. In theory, as the mulch breaks down it will tie up the nitrogen from the chicken manure and not from our crops we planted. So far, so good. If you planted a hardneck garlic variety last fall, you might have started to notice weird curly tendril-like growths coming out of your plants. If you haven't already, you'll want to snip those off at some point. They are called garlic scapes, and will turn into a cluster of bulbils (mini garlic bulbs), and letting them grow will sap the garlic bulbs growing underground of energy and make them smaller up on harvest. The time to snip them is when they grow into a full circle, although some say you can pick them earlier. Last year, I picked mine when they first started coming out, and the plants sent out a second scape, which further sapped the bulbs of energy. So I waited until they were fully curled this year. Scapes in the garlic patch. After you pick them off, not only will your hands smell like garlic all day if you neglected to wear gloves (as I did), but you might wonder what you should do with the scapes. Sure, you could compost them, but if you are growing garlic, chances are you're a garlic lover, and scapes are most definitely edible. Several scapes ready for preparation. I think of garlic scapes as a garlic version of green onions; they taste of mild garlic instead of onion, but have a fresh "green" flavor. They are good in almost any scenario that a green onion tastes good in, but they are unique and can be used in other sorts of recipes. I've cut them into 1/2" pieces and adding them to green salad, potato salad, and pasta salads. They are great in a stir fry. I've seen recipes for pesto and other sauces. Really, the only limit to using scapes is your imagination. So don't let them go to waste! Here are some up-to-date pictures of my garden. We had almost a straight month of rain, so my tomato plants are fairly stunted, as are the peppers and eggplants. One of my coworkers mentioned that her tomatoes were almost three feet high, because she kept them under row covers. Next year, next year. My hopes for this summer aren't dashed yet, though. The sun has come out for three days this week, and the weather forecasters seem a bit more optimistic of late. We've got plenty of summer left! Here is the garden from the same perspective as previous pictures. It looks pretty good, despite the cool weather. Peppers, eggplants, tomatoes, and other warm-weather-loving crops could definitely be doing better, though. Tomatoes - the big "ringer" plants are doing great (we've had a few cherry tomatoes off two of them already!). The smaller heirlooms which I started myself are doing variably well - some are large, but several are very tiny (my Green Grape is one inch tall, but somehow hanging in there) and about 8 plants died. Luckily, the "up for grabs" table in the cafeteria had some tomato seedlings on it this morning, plus a couple of Goldie husk cherry seedlings, of which I have one growing (you need two for pollination). The potatoes LOVE rainy, cool weather. I need to get more compost to fill the cans to the top - they really took off while I was away for a week. So far I'm pleased with the cans, but these will be some expensive potatoes - my yields better justify the costs. The beans are starting to tendril up the trellis. On the left side of the two A-frame trellises, you can see little cucumber plants - they need some sun, 'cause I want to make pickles! Squash on the left side of the trellises, peppers in front. These plants are stunted too, but have grown almost visibly in the couple of sunny days we had this week. Soon they'll send up tendrils and climb. This is my first year growing sweet potatoes. The slips were very tiny, and I think the rain has helped them get a good footing in the garden. They are starting to leaf out, and I imagine they'll start to run (vine out and take over) soon - I'd better set up another trellis! And there's Mr. Slug (or one of his myraid relatives) in the background, heading for a snack. I have quite a few slugs in my garden, but they don't do much harm. We also have plenty of catbirds and sparrows and starlings in the yard, and I think they do a good job keeping the slug population at bay. The onions, shallots, and, of course, garlic are all doing well. Tomatillos and eggplants in the foreground could use a little more warm weather. Let's hope it's on its way. I hope you're all having good luck in your gardens!! I planted about five acres of oats and annual alfalfa three weeks ago Thursday and that was the last time we could get on the ground. Luckily we cultivated all the crops before this wet spell or we'd be in real trouble. The oats/alfalfa is doing really well and will really kick in with the growing once the weather warms up. The mix should get a foot and a half tall this summer. We'll mow the oats late summer and give the alfalfa a chance to get some decent growth before cold weather. So, you might ask what we do in all that rainy weather. We work in the fields like any other weather. We cultivated last week, and although it didn't kill a lot of weeds, it did set them back a few days. 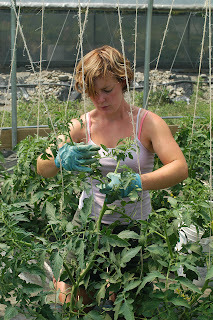 Tomatoes can be trellised and we've got lots of tomatoes this year! Weeds too large to be cultivated can be pulled by hand. Here's an interesting side note that goes along with my last statement: Weeds pulled up in the rain must be put on the plastic or removed from the field to prevent them from rerooting and continuing their growing cycle. They'll not miss an opportunity to reset their roots and produce seed so vigilance is imperative. At least twice a week and usually three times a week I "scout" the fields. Scouting is what it sounds like: looking for pest damage and disease pressure, checking the moisture levels to determine if tractors can work the soil, estimating harvest dates and anything else that catches my eye. Scouting frequently is useful to determine future problems and what we can do about them. Sometimes a pest will be in a field on Friday that wasn't there on Tuesday. Early detection helps us formulate a plan of attack. I sometimes take a sweep net with me; usually to detect leaf hoppers. "Sweeping" the net between the rows will dislodge them and cause them to fall into the net where they can be observed. Lots of them warrant spraying whereas a few of them do not. Speaking of spraying, we're doing lots of spraying this year. Actually I can say Mike Bowman is doing lots of spraying this year. 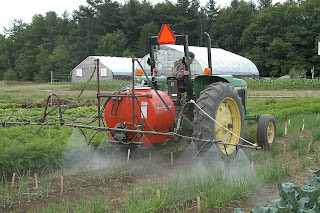 We're spraying tomatoes for early and late blight, cucumbers for bacterial wilt and, starting next week, onions for thrips. For many years we sprayed the onions when we first noticed their damage. The problem is that by the time you notice the damage too much damage has occurred and spraying insecticides won't do a whole lot of good. 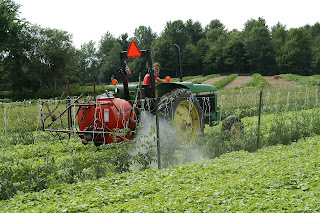 We start spraying right after the fourth of July and spray once a week for a month and a half, and then we'll have no thrips and a beautiful trial.